Mine Block is an adventure free minecraft game in which multiple steps to for next level. Player has to think more creative at every step. 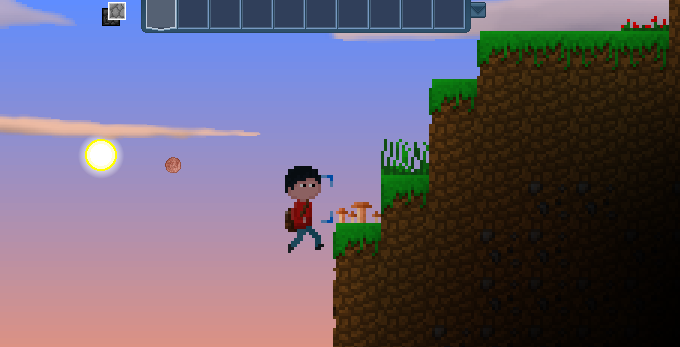 The aim of the game is to build constructions out of blocks in a 2D procedurally generated world. This is the single-player game and you will find more innovations as game move on. Moreover, This is the alpha version of Mine Blocks 2. This means that the game is not finished and that there isn't a lot to do yet. How to Play this Game? Arrow keys to move. Shift-click to place blocks, click and hold to mine. Click to select inventory items. New features: - Day/night cycle - Clouds, sun, moons, and sky - Red flower plains - Mushroom plains - Cotton field So you should try at least one time to get more features.